While walking our Vizsla tonight in our woods (right off the intersection of Wood and Shady Rill), Penny raced after something down in the woods. I saw a raccoon-sized animal run for a tree and the dog was barking like crazy so I started down through the pines to check her. There was a lot of tree-scrambling noise and as I yelled, I saw Mama Bear sort of looking at me and realized that several cubs must have been treed. Fortunately, Penny must have also seen the bear because she came right back and went right up the path to the house. I hope my electric fences protect the beehives — there’s not much out there for her and the kids to eat. I just wanted to let everyone know that the black bear is still on Hardscrabble Road in Bristol. It was seen in the back yard of a home located just a few houses up from the Red Cedar School at about 5am today. It was was walking the perimeter of the yard eating blackberries from the branches. Estimated weight was about 225lbs. To all my neighbors – Woke up on Thursday to find my bird feeder poles bent over and the feeders on the ground. I thought it was merry pranksters, my wife said it must be a bear, so I straightened out the STEEL pipes and refilled the feeders and went about the day. We did activate the motion sensor lights though. Last night the lights went on and we looked out the window and stayed in the house, unlike our Governor. It is indeed a bear, and a big one, at least 250 pounds. Well, it was only the one bear but here’s what happened. I learned something about bears because of this experience. From time to time our family will have a little campfire. I’m sure you guys know what I’m talking about: S’mores, maybe some adult beverages, a few friends. Pretty low-key stuff. Well, this one night a little earlier this Spring (when it hadn’t rained for a bit) we were having a fire and generally enjoying ourselves by the fire pit. Maybe it was the smell of the roasting marshmallows that drew the bear towards us, I don’t know. Anyway, I had just put a log on the fire when a spark jumped out and started a little tuft of grass on fire. I stumbled around a bit and I thought I had the loose fire under control. That’s when it happened: This big old bear comes crashing out of the woods and just starts stomping around the fire. He put it right out! We were in shock, to say the least. Then he grabs a shovel and commences to dousing our fire while, I swear this is true, grumbling about idiots lighting fires during the dry season and didn’t we see the warnings about fires and how he lives here too. Then, he grabbed the remaining beers (and the last s’more!) 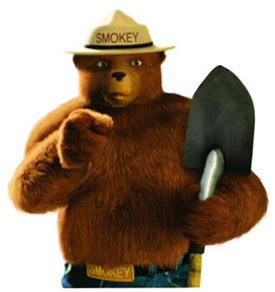 and said “Remember: Only YOU can prevent forest fires” before stomping angrily off to the woods. We were stunned. I just want to say, while I appreciate bears sharing the land with us, I think Smokey is kind of a jerk for taking the rest of our beer and ruining our get-together. Bears should just stay in the woods.